A nonphytotoxic, colorant and antidesiccant formulated to impart a natural green color to dormant or actively growing turf. Wintergreen Plus protects sensitive turfgrass during dormant periods and accelerates spring green-up by absorbing sunlight with its deep green color. 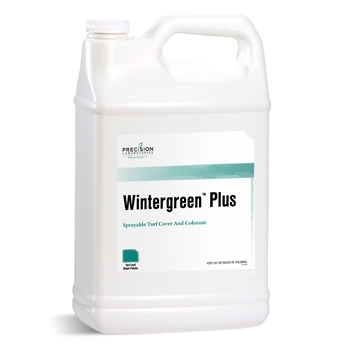 Used as an alternative to overseeding, Wintergreen Plus saves time, water, labor and money. 16 - 32 ounces in 3 gallons of water per 1,000 ft2. Make two perpendicular applications. 8 - 12 ounces applied in 1 gallon of water. 8 ounces applied in 1 gallon of water.